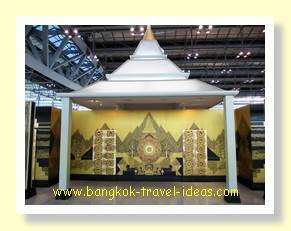 A 6 hour Bangkok layover need not be such a burden if you plan ahead and find out what there is to do near Bangkok Airport? Well, for one thing, you can make good use of the time and get out of the airport to go stretch your legs, as I will describe to you. On a recent flight from Shanghai to Sydney via Bangkok, my arrival time was to be 12:40 pm at Bangkok Airport and my connecting flight to Sydney did not leave until 6:40 pm. Having just spent 5 hours waiting at Shanghai Airport I was extremely aware of how boring it can be just waiting around with not much to do and I didn’t relish repeating the trauma. For some reason four hours in an airport seems manageable, but any more than that really becomes tedious. If you are flying via Thailand and have a Bangkok layover at Suvarnabhumi Airport then read on, because you may be able to adapt my experience to your own situation and turn it into an opportunity. I had already given it a lot of consideration and before getting on the first flight I had already decided to leave the airport and not wait around. I was sick of sitting in lounges. My flight from China arrived at Bangkok Suvarnabhumi airport at 12:40 pm and by 12:50 pm the plane had taxied to the air bridge and I exited the airplane and proceeded to the Immigration lines. It was a medium length walk of about 600 metres, but using the moving walkways at Bangkok Airport I got to the immigration hall in no time. On this particular day the immigration hall was full of people and I counted 40 people in each line. 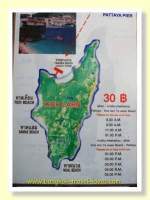 I estimate that people in the queue would have a wait of 40 – 60 minutes to be processed. Luckily for me there was only a queue of 7 people at the Express lane and I was granted entry to Thailand by the immigration desk officer by 1:04 pm, my passport had been stamped and I was through the first hurdle. As my suitcase had been checked all the way through to my final destination there was no baggage to wait for. Very quickly I exited through the Green Customs channel, past the hotel greeters on the right hand side, round past the Meeting Point sign and down one level to the taxi stand. When I walked out of the Airport building the wall of humidity hit me, the temperature was a warm 32 degrees Celsius which was a big difference from the 5 degrees Celsius of Shanghai. There was a bit of a queue and a short wait for a taxi, but by 13:15 pm I was in one of Bangkok’s finest taxis heading to my destination. I had calculated the time I could be out of the airport and my 6 hour Bangkok layover required me to be back at Suvarnabhumi Airport by 4:40 pm to check in again. My connecting flight was scheduled for 6:40 pm and I didn't want to miss it. I estimated that I had about 3 hours out of the airport, before I needed to start to head back. 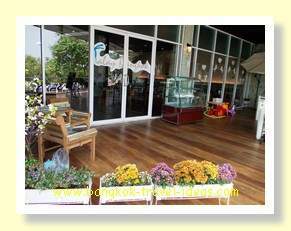 Bearing in mind the short amount of time available to me, I chose to visit the Paseo Mall on Ladkrabang Road, which is just 8 minutes from Bangkok Suvarnabhumi Airport. As this was the first time that I had attempted to leave Suvarnabhumi Airport between flights on a Bangkok layover I didn’t want to stuff it up and miss the connecting flight. The taxi set off and in no time at all, I was there and the taxi dropped me off at the front of the Paseo Mall at 13:25 pm, where I had arranged to meet an old friend. I paid the metered fare of 65 baht and the airport surcharge of 50 baht and we went to get some lunch. 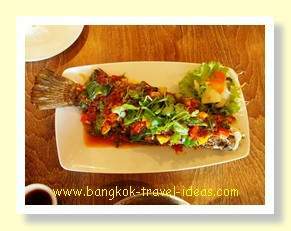 Do You Like Bangkok Seafood? There are a range of dining options at the Paseo Mall Bangkok and today I chose a new establishment called Bangkok Seafood. 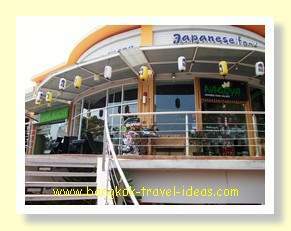 As you enter the Paseo Shopping mall you will see a set of stairs near to the Massage shop, that lead up to a balcony and the seafood restaurant is on that upper floor. 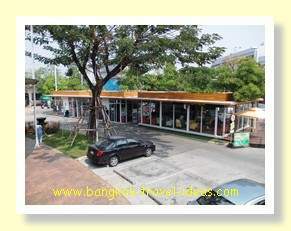 The Paseo Shopping Mall Bangkok really comes alive in the evening when the night market stall holders get set up. They only operate from Thursday to Monday, so take note of that if you have a late incoming flight. At the time that I arrived most of the stalls were still being set up and cars and vans were still being unloaded. 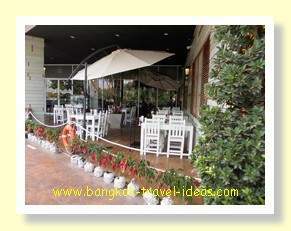 The Bangkok Seafood restaurant was almost empty, so the service was quick. Lunch for two people consisted of two bowls of rice, a plate of somtam Thai, dried beef pieces and spicy dipping sauce, a large fried fish with chilli sauce as well as a bowl of glass noodles and crab together with Pepsi and water to drink. Lunch was over by 3:15 pm and I requested the bill and was pleasantly surprised to find that it totaled the princely sum of 800 baht. So far my Bangkok layover was all going to plan. After eating lunch, we went for a walk around the market to have a look at the fixed shops, as even by 4:00pm most of the market stalls were still not set up. The Paseo Mall market is not aimed at tourists, but is more a typical Bangkok street market; here they have freshly cooked foods and ladies fashion items such as jewellery and watches and if you have a short Bangkok layover it is a good place to get that last minute gift for the family. Bangkok Seafood has since closed down, but the good news is that the mall has been considerably extended and there are numerous other places to eat, there are even a couple of great massage parlours. After browsing the market, it was time to catch a taxi back to Suvarnabhumi Airport. Ladkrabang Road has plenty of taxis and you will not have any problem getting back to the airport. I hailed a taxi at 4:00pm and said “Bpai Suwanapoom krab” to the driver and off we went. The return journey was a little bit longer and took about 12 minutes, but by 4:15 pm I was back at Bangkok Airport where the first stop was the Thai Airways check-in counter. Talking with the check-in lady about my Bangkok layover, I told her where I had been and she suggested next time taking the bus to Mega Bangna, which is a very large shopping centre close to the Airport. That is certainly something to consider for a future Bangkok stopover, particularly if the flight lands early morning. By 4:35 pm I had obtained my new boarding pass and changed my seating and after passing through immigration I went to the Thai Airways lounge for a shower and bit of a cleanup. If you don’t have access to the Thai Airways lounge then there are a couple of other places in Suvarnabhumi Airport where you can take a shower. Firstly there is the Chang Massage and Spa outlet and secondly there is the Miracle Lounge. Unless you are already a member of Miracle Tavern, then Chang Massage and Spa would probably work out cheaper. By 5:00 pm I had showered and felt all clean again. My boarding time was listed on the boarding pass as 5:40 pm and so I reckoned I still had time to fit a massage in, just before going to the boarding gate. I walked over to the Thai Airways Spa centre where I made my selection of massage and then sat down. Whilst I was waiting my turn I was brought a cold towel and cold drink, which could best be described as a sort of Rosehip extract. It was quite pleasant and refreshing. After a couple of minutes my name was called and I was treated to a complimentary 30 minute neck and shoulder massage, which concluded with a cup of hot ginger tea and a choice of snack. I gave the massage lady 300 baht tip, why not I thought. By now the time was 5:45 pm, but I knew from experience that boarding is nearly always later than the time posted on the boarding card. Not wanting to miss my flight I walked down to the boarding gate at C6 and arrived there at 5:54 pm to see all the passengers still waiting. My timing was impeccable though, as within few minutes we were called to board the aircraft. So what did I think about my 6 hour Bangkok layover? Was it worth the time and effort to leave Suvarnabhumi Airport and what did I achieve on my 6 hour Bangkok layover? Had a shower and a massage and best of all I felt really refreshed and ready for the next leg of the journey. 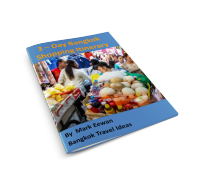 Having completed this exercise of leaving Suvarnabhumi Airport on my 6 hour Bangkok layover, I did learn a couple of things that may be helpful. The length of the immigration queue is really an unknown and you should factor some additional time for this processing to happen. I arrived the day after the Iranian bombing incident and border security screening had been stepped up and was taking longer than usual. Hence the back log. Similarly the length of the immigration queue when you arrive back at Suvarnabhumi Airport on occasions can also be long, so ensure you follow your airlines advice as to your minimum check in time. The Paseo Mall is open every day, but the night market only operates from Wednesday to Monday and judging by the degree to which the stalls had been set up then I think that you need to go to see this market at 5:00 pm or later. If for some reason you are not able to check your baggage through to your final destination then you can leave it at the baggage store. This is located after you pass through Customs on the right hand side, just before you reach Door 4 and the Meeting Point sign. The cost is 100 baht per piece per day. They won’t accept any valuables inside the bags, so you will need to take your laptop or iPad with you. Most people will have to pay 700 baht departure tax when they check in again at Suvarnabhumi Airport, as this will not have been included in the original ticket price. In my case the China trip was a side trip on another ticket and it had already been paid. Next time you have a Bangkok layover then don’t just sit around the airport, take the time to stretch your legs and get a breath of fresh Bangkok air. 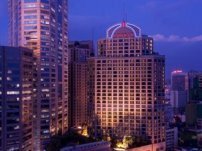 You might also consider staying at one of the nearby Bangkok Airport Hotels that can be booked from as little as $26 or if you like to splash out then you can stay at the Novotel Suvarnabhumi Airport Hotel. 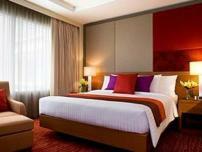 Read my review, it is a strongly recommended hotel.